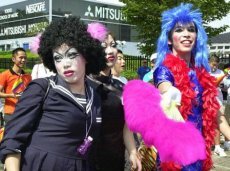 Drag queens gather at Yoyogi Park before the beginning of the Tokyo Gay and Lesbian Parade Sunday. Apple released their new iCal program today. I’ve already started using it and must say that it’s pretty nifty and easy to use. I’ve been trying to get my schedules in order for a while now, and hopefully this will help out. It’ll also be nice when their iSync program comes out at the end of the month, which will let me put all of my calendars on my iPod. Also, after having listened to a few other tracks from the band OK Go that I found online, I have to say that nothing else excites me like the single. I really hate these one-great-single bands. I’m having a harder time finding Ikara Colt tracks. I just posted a new Tokyo Boy log at The OPi8 Forum. More pics from China. In Japan we get to see 2 episodes of THE CONAN O’BRIAN SHOW a week, that they show during the weekend on CNBC Asia. I was watching them this week and on one of the shows there was a performance by a band called OK Go. They rawk, and have a definite Pixies vibe. Not long after, I saw the video for the same song (“Get Over It”) on SpaceShowerTV (a music video channel). I’ve just downloaded a bunch of MP3s to check them out some more. Also, today I saw a video by a band called Ikara Colt. I swear that at first I thought it was a young Sonic Youth (the video is made to look old, and you don’t see the member that well). They also have the rawk. Phoot Photos Daily has a new series of pics up on a daily basis, and it’s really nice stuff. As you can see, I’ve just made a big revision to the site. I’m still playing around with it, but this is something I like a lot better than what I had up last week. The idea is that a lot of links are going to be popping up in boxes, here and there. I’m planning on getting links to all of the stuff I’ve done on the Web in the past 4 years. At the bottom you’ll see a link to AS (Acadiespatiale.com), which was the main project I worked on for close to 4 years with my good friend Guy Bourgeois. It was a site that promoted Acadian (French speakers from the Maritimes, in Eastern Canada) culture and ideas. We officially closed the site last week, which is now going to give us more time to work on future projects, one of which is this site for me. I’ve been writing a weekly column in French for the whole time about my life in Tokyo, often including pics, and this is what I hope to continue here, but with even more updates thanks to the ease of use of Blogger. Right now I am kinda drunk. We had some friends over for dinner, and we showed them our videos and pics from our trip to China in August. Good food, and good beer, was had by all. One thing I really like about Japan is the fact that the major beer makers come out with lots of seasonal beer. You’ve seen a previous post about Suntory’s Fall beer, and tonight I tried out Asahi’s offering, which was pretty damn tasty. Also, as I was on a beer run at the local combini (convenience store), I got to see our local matsuri in full effect. There were people dancing, kids playing games while wearing their yukatas (a kind of kimono that you wear in the Summer), and lots of classic matsuri grub to be eaten. I took a couple of pics, which I’ll probably post tomorrow. Today is my neighborhood’s annual matsuri (festival). I walked out to the main street to see lanterns hanging everywhere and people wearing their yukata or jimbei. Later in the evening, they will walk around carrying huge portable shrines. I’ll try to go out later and take some pics. I do a log twice-weekly (Mondays and Fridays) at The OPi8 Forum, in the Transmit: New Dark Culture Logs section, called TOKYO BOY. I just posted the new one. Yes, the one and only Pitfall!, in all its original Atari glory. I am wasting way too much time on this.